NORTH VANCOUVER — Brian Brady always knew it was going to be a little dicey in terms of the timing from the moment he heard that he and the rest of his 2003 Simon Fraser Clan football teammates were going to be honoured during the team’s final GNAC game of the season this Saturday atop Burnaby Mountain. Yet perhaps the football gods were giving the head coach of the Carson Graham Eagles, and almost all of his coaching staff for that matter, the best chance possible to really soak up the day’s karma. That’s because in a case of happenstance, the Eagles (2-6, 2-5) have been scheduled to play their 2018 Subway Bowl opening-round playoff game Saturday (5:30 p.m.) against the powerhouse, No. 4-ranked Terry Fox Ravens (8-2, 5-2) on none other than SFU’s on-campus Terry Fox Field, following the Clan’s 1 p.m. clash against the visiting Humboldt State Broncos. BCSSFA rules state that all playoff games must be played on turf fields, thus the home team, Terry Fox, looked for a facility within its region and was able to secure the Clan’s field, one named in honour of the Canadian icon who both graduated from Terry Fox (then Port Coquitlam Secondary) and later attended SFU. 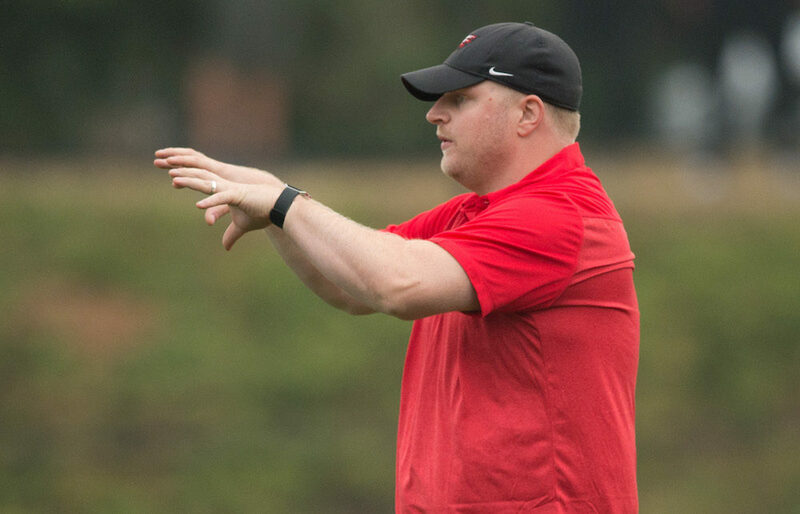 There are connections to SFU from both high schools, including Terry Fox defensive coordinator Tom Kudaba, a Clan alum who played in the CFL, then later coached on the hill as an assistant under Kelly Bates before returning to work with the Ravens. At Carson Graham, the Clan connections are a virtual laundry list. Start with head coach Brady, an offensive lineman on the 2003 team which won the Hardy Cup, and landed a win shy of a spot in the Vanier Cup when it was blitzed on the road in the Uteck Bowl by the Blake Nill-coached St. Mary’s Huskies. That Clan team included such stars as quarterback J.R. Davies, receiver Brendan Mahony, the Calgary Stampeders’ director of Canadian Scouting, centre Obby Khan, running back Marty Kipps and safety Scott Plummer. And the team was coached by The Bear, SFU’s longest-tenured head coach Chris Beaton, who openly wept tears of joy after the SFU’s Hardy Cup win over Alberta. Carson Graham coaches Bruce Leitch, Bill Dyer, Nic Shuster, Mathis Baumbach and Tony Strong all played for the Clan. Of course, paramount in the world of the Eagles has been prepping to stop the juggernaut ground game of the Ravens, one whose multi-headed attack seems custom fitted for a chilly November Saturday. Most opposition coaches recite jersey numbers of opposition foes that need to be stopped. Brady knows them all by name and doesn’t skip a beat on pronunciations, either. Yet it’s not a stretch to say that the Eagles might be the best team to not occupy a spot the entire season in the Varsity Letters Big 5 B.C. AAA rankings. Playing out of the Western Conference, their only true blow-out was a 42-12 loss at Vancouver College back on Sept. 22. Carson, in fact, has been prepping for its opening-round Subway Bowl game since Oct. 20 because after losing to a rapidly-improving Mt. 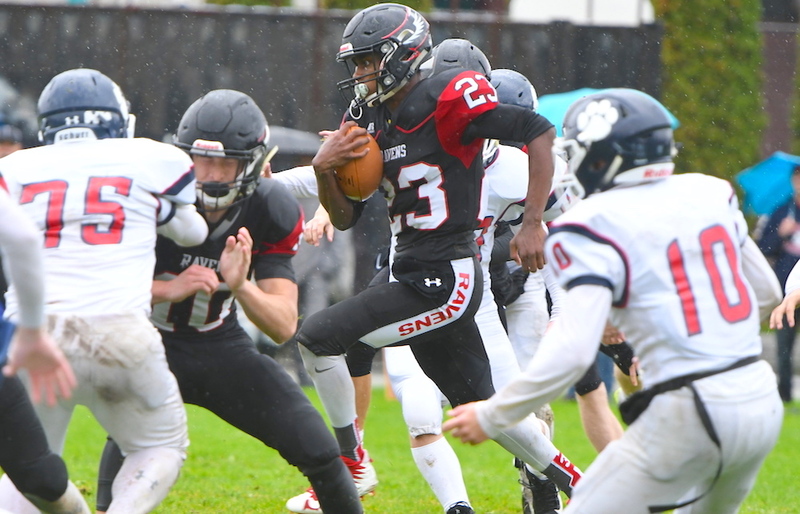 Douglas Rams team 33-27 at home on Oct 19, it has endured a cancelled game due to folding this season of the Belmont Bulldogs, and then a scheduled bye on the final weekend of the regular season. Yet an upset of the Ravens will take the Eagles’ best effort of the season. 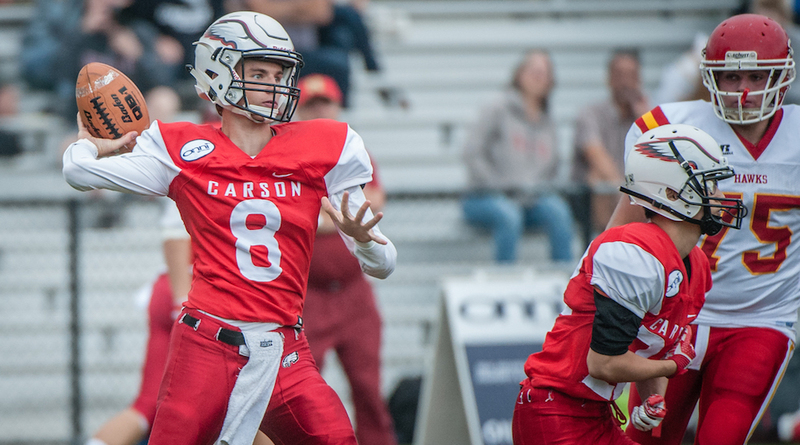 Carson Graham is one of the province’s best passing teams, and with senior quarterback Charlie McMillan gaining more and more comfort in the team’s new Air Raid offence, the abilities of its receiving core, around star Liam Scott, have shown great depth. “We have Liam that we can feed but we’ve got four or five receivers that have all had great opportunities to catch the ball,” said Brady. The team also made a tweak to its running game, when it asked starting defensive end Parker Henderson to do double-duty and line-up in the offensive backfield. In the loss to Mt. Douglas, Henderson rushed 18 times for 85 yards and a touchdown. The Carson Graham defensive line brings size and is a veteran-laden group, with linebacker Mahyar Hosseini and both Kwame Mensah and Kinneth Balucos in the secondary, all seniors, providing their experience. With the size of the Eagles’ task at hand, they could do a lot worse than feeding off the karma which will envelope Terry Fox field on Saturday as their head coach’s former university team is honoured. Maybe it’s the football gods’ way of say of saying that this is a game that you don’t want to miss. The winner of Saturday’s game will be paired against the winner of tonight’s other opening-round game between Notre Dame and W.J. Mouat, in a quarterfinal game likely to be one of five staged Nov. 17 at B.C. Place Stadium.